The American Boxer Club was founded in 1935. 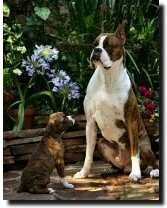 The ABC is the national parent club dedicated to the well-being of the Boxer breed. The Club is also responsible for the written Breed Standard--a description of the ideal Boxer. In 1995 a small group of people who loved the Boxer breed, decided that it was time to "give back" to the breed that gives us so much. 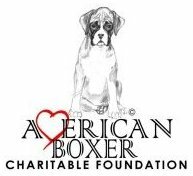 This resulted in the formation of the American Boxer Charitable Foundation. The Mission of the Foundation is simple. It is simply to raise money to be used to fund research into the health-related issues that face our beloved breed. This means all of our breed ... from the fine showdogs, to the Obedience, Agility and Performance dogs, beloved family pets and even the abandoned Rescue Boxers that break our hearts. It benefits Boxers with cropped or uncropped ears ... as well as fawn, brindle and white Boxers. We are about the health of our breed! All of our breed. The Foundation then had to devise means to raise the money needed to pay for the research that needed to be done. To accomplish this Mission, we utilize fundraisers and these fundraisers fall into two categories ... Supporters and Members. SUPPORTERS: This list includes those who help with our largest fundraiser, our Annual Auction held at our National Specialty Show in May of each year. This event is manned entirely by volunteers and generous Boxer lovers donate all of the items. It's truly amazing to see how each year, the volunteers show up, the items flow in and the room fills with people willing to spend money to help our breed. It is an evening that truly puts the FUN back in FUNdraising. Also included under the heading of "Supporters" are those who donate to our Endowment Fund through Memorials and Honorariums. If you want to remember or donate in the name of a friend or Boxer, simply send your donation (along with the name and address of the family) to the Foundation and we will send a lovely acknowledgement card to the family of the person/dog that you are honoring. Another form of Support is to purchase any of the varied Boxer items we sell. Please remember that the profits from each of these items are used to fund research for our Boxers! What a wonderful way to help our breed. All web content questions and comments should direct to Webmaster.